Germination is variable and can take between 2-5 weeks, so I was surprised to see 3 seedlings appear yesterday, less than a week after I planted them. Six of my chilli plants have yet to germinate but the other 6 are doing well and have been transplanted to bigger pots and placed on the windowsill. Have managed to kill off a few and a couple of plants still haven’t germinated. 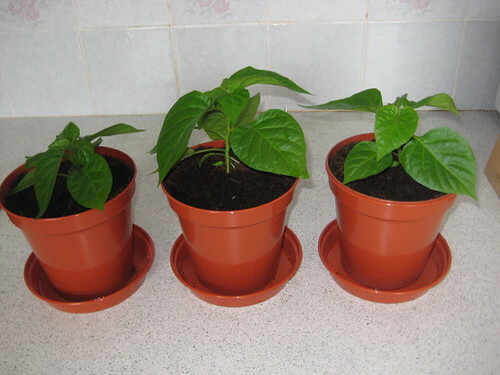 I now have 5 chilli plants from the original; 12. Only 3 really healthy plants remain. I’ve re-potted these today and will leave them on the windowsill for another couple of weeks before gradually hardening off in the garden. I should still get plent of chillis from the 3 plants. This planting is in the Veggies in Pots garden . Sown from my Chilli - Scotch Bonnet Red Seeds. Well done, they are coming along quickly aren’t they. My scotch Bonnet ‘Big Sun’ seeds were sown Feb 12 and only one has shown yet, just poking its head up but not moving at all. Out of the 12 seeds, only 5 have survived. I managed to kill a few off and 2 have yet to sprout. Still if the 5 remaining survive, I’ll still hopefully have a good crop.